A volcano is a landform created by magma from the earth's interior which penetrates through weaknesses in the Earths surface. Most volcanoes are formed at plate boundaries. They are classed in one of three categories of activity: active, dormant or extinct. Magma contains a mixture of silicates and dissolved gases. As magma rises closer to the Earths surface the pressure decreases and the dissolved gases come out of solution to form bubbles. As the bubbles expand the magma is pushed into the volcanic vent until it breaks through weaknesses in the Earth's crust. The explosive potential of the volcano is dependant on the effervescence of the gases and the viscosity of the magma. High gas effervescence and low viscosity cause the most explosive eruptions. As previously mentioned volcanoes occur at weaknesses in the Earths surface, these are in one of three tectonic settings: subduction volcanoes, rift volcanoes and hot spot volcanoes. Subduction volcanoes occur where one tectonic plate is thrust and consumed by another. This type is the most explosive and comprises approximately 80% of the worlds active volcanoes. Rift volcanoes occur where tectonic plates diverge, often on the ocean floor. These are generally less explosive. Hot spot volcanoes occur in the middle of plate boundaries where magma exits from weaknesses in the earth's surface. The Hawaiian Islands are an example of hot spot volcanoes. The most active area of volcanic activity occurs along the pacific plate boundary which is often referred to as the 'Pacific ring of fire'. What Hazards Are Related To Volcanic Eruptions? There are about 500 active volcanoes thoughout the world. In an average year approximately 50 of these erupt. Volcanic hazards create fewer disasters and deaths compared with earthquakes and severe storms. Many of the deaths associated with volcanoes are indirect hazards such as famine due to crop damage or from secondary hazards such as lahars. Volcanoes are composite hazards. 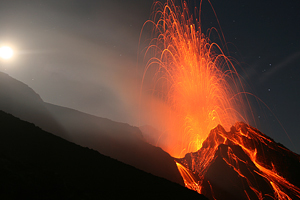 There are both primary and secondary hazards which can be caused by volcanic eruptions. The primary hazards include pyroclastic flows, air-fall tephra, lava flows and volcanic gases. The secondary hazards include ground deformation, lahars (mudflows), landslides and possibly tsunamis in ocean floor volcanic eruptions. Mount Vesuvius is classified as an extremely violent volcano, which has been best known for its catastrophic plinian eruption in 79 AD. The eruption caused total devastation to the town of Pompeii and Herculaneum, claiming around 3,360 lives as a result of pyroclastic flows, ash, tephra and lahars. Over the years victims of the eruption, have been discovered in a perfectly preserved state due to the ash and mud, giving us an insight to the agony victims must have faced. Since the 79 AD eruption Vesuvius has erupted a number of times, killing large numbers of people, in which the last was in 1944 and is believed to be dormant at present, over due to an eruption any time. Mudslides and lava flows from the eruption in 1631 killed over 3, 500 people and about 3,360 people died from ash fall and pyroclastic flows in the 79AD eruption. The eruption of Laki in 1783 is another example of volcanic activity which had global consequences. The eruption in 1783 lasted for nearly a year and released 15 cubic kilometres of lava over just 8 months. The lava released huge amounts of sulphur dioxide and fluorine, which affected the climate causing famine and weather anomalies in the Northern Hemisphere. As a result of drought, famine and gas poisoning, 9350 people died in Iceland as well as thousands of livestock. A similar eruption of Laki would have a huge consequence for the Northern Hemisphere today. Tambora, a stratovolcano, is located on the northern island Sumbawa, Indonesia. This well known historical volcano erupted in 1815 with a massive VEI 7 (Volcanic Explosivity Index), causing total devastation. It is known as the most explosive eruption recorded to date, killing over 80,000 people as a result of pyroclastic flows, tsunamis, famine, disease and starvation. An estimated 600km around the volcano plummeted into darkness for up to 2 days due to the massive amounts of pumice and ash released into the atmosphere as a result of the eruption. The vast amounts of sulphur released in the atmosphere caused devastation around the globe which led to 1816 being known as ‘the year without summer’. Crops failed, famine struck various countries around the world, temperatures dropped and strange weather phenomena occurred such as the falling of brown snow and persistent dry fog. This submarine volcanic eruption was one of the violent eruptions in the last 3,000 years. The eruption on the 27th August blow the whole northern and lower areas of volcano, creating an explosion which was heard nearly 3,100 miles away. The discharge of volcanic ash was transported in air currents and was diffused for years, the effects of this ash affected North and South America, Europe, Asia, southern Africa and Australia. This was not the worst consequence of this eruption; the disintegration of the volcano caused a tsunami which inundated coastal areas of the islands of Java and Sumatra, killing 36,000 people. This Peleean eruption destroyed the town of St Pierre which left only two survivors out of a population of approximately 30,000. Peleean eruptions are very explosive and are characterised by pyroclastic flows. Mount St Helens erupted on 18th May 1980 leaving 57 dead. The volcano erupted following 2 months of earthquakes, and a 100 metre bulge that grew 2 metres per day on the north east side of the mountain. On the day of the eruption a lateral blast occurred causing the bulge to get displaced, which in turn caused an avalanche. A pyroclastic flow, caused by the eruption, travelled at up to 540 km/hour with temperatures up to 700 degrees Celsius, causing total destruction in its path before flowing into Spirit Lake. This in turn caused lahars, adding to the destruction. The ash column rose 20 km into the atmosphere and travelled 400 km away from the immediate area. The total cost of the eruption was $39 million worth of damage to agriculture, $103 million to property, $450 million to forests and $363 million for the clean up. Mount Unzen is located on the island of Kyushu, Japan and caused the worse known eruption the country has ever witnessed. In 1972 the volcano killed an estimated 15,000 people when tsunamis were generated following the collapse of domes caused by an earthquake. Devastating lava flows were also blamed for the death toll. The volcano also erupted violently in 1991 following months of continuous seismic activity. Despite 12,000 people being evacuated, the eruption claimed 43 lives of scientists and journalists. Since then numerous pyroclastic flows and lahars have been generated, destroying over 2000 buildings. This eruption is one of the worst volcanic disasters in recent times. The volcanic eruption melted ice and the snow cap of the Nevada del Ruiz volcano causing a torrent of water, mud, debris to travel down all six major river valleys away from the volcano. The lahars increased in size as they travelled down the river channels, eroding loose soil, rocks and vegetation. The lahars travelled 100 kilometres, killed approximately 25,00 people, injuried 5,000 and destroyed over 5,000 homes. The worst town hit was Armero: three quarters of its 28,700 population died during the mud flows. Lake Nyos is a volcanic crater lake located in northwest Cameroon. In 1986 the release of 1.6 million tonnes of carbon dioxide from the lake spread as a dense cloud, 25 km away from the lake killing 1746 people and 8300 livestock in surrounding villages. 3460 people were also moved to temporary shelters due to the severe risk of asphyxiation (suffocation) which was the cause of death. This tragedy occurred at night when the villagers were asleep and therefore having no chance of survival. The characteristics of the gas; being both odourless and colourless is what makes it so lethal since the victims would have had no awareness of its presence. The Lake is now degassed to release controlled amounts of carbon dioxide in order to prevent a similar tragedy from occurring again. This eruption was not only a disaster in terms of human loss but it had a major effect on the global temperature and ozone depletion in the years following the eruption. Approximately 200 people died because of the ash released during the eruption. During the time of the eruption Tropical Storm Yunya was passing 47 miles northeast to Mount Pinatubo, causing high rainfall rates in the region. The ash which was released from the volcano mixed with water vapour in the atomosphere to cause a rainfall of tephra. This water saturated ash fall fell on to rooftops which subsequently collapsed due to the excessive weight. It is thought that had the tropical storm not been present the death toll would have been significantly lower. The gas and ash cloud produced by the eruption reached high into the atmosphere and travelled around the world within a year. During the years of 1992 and 1993 the average temperature in the Northern hemisphere had dropped by approximately 0.6 0C, the entire planets temperature dropped by 0.4 -0.50C. The eruption also ejected between 15 and 30 million tons of sulphur dioxide gas. In the atmosphere the sulphur dioxide gas mixes with oxygen and water to form sulphuric acid which aids ozone depletion which caused the ozone hole over Antarctica to enlarge. It is thought this global change in temperature and climate caused other natural disasters such as the 1993 Mississippi floods. After years of dormancy Soufriere Hills, a stratovolcano became active in 1995. The volcano has had on going activity which has consisted of destructive pyroclastic flows and surges, debris flows, lahars, dome collapse and tephra falls as well as seismic activity. The continuous activity led to the evacuation of most of the island’s population over the years, especially after the destruction of the Island’s capital Plymouth. Plymouth, along with various small villages were destroyed and buried under thick layers of ash, debris and pyroclastic flows deposits, leaving them uninhabitable even today. 1997 was when the most explosive eruption occurred, killing 19 people who were in the restricted zones despite constant warnings and advice. The Island’s airport was also destroyed by pyroclastic flows and surges and had to be rebuilt at a different location. Although some of the Island’s population has once again returned, most of them have relocated on neighbouring islands or abroad. Today, the volcano’s on going activity is closely monitored by scientists and warnings given when necessary. Nyiragongo erupted on January 7th 2002, destroying 15% of the city of Goma. Nyiragongo is well known for its large volumes of lava flows that cause devastation and destruction to anything in its path. In 2002 the lava flows spilt the city of Goma into sections, killing 147 of which 50 died during a petrol station explosion. The eruption also destroyed 14,000 homes, left 75% of the population displaced and led to the evacuation of 400,000 people. An eruption in 1977 also killed an estimated 2000 people and destroyed villages in its path. The volcano is active today, however due to the activity being confined to the crater, no victims have been claimed. When the next disaster will occur will only a matter of time.